Brewing lots of herb teas and crafting our favorite herbal home remedies has been an almost daily adventure in the still room this winter. Even with preventive measures, family members have had the seasonal discomforts of coughs, colds, and such. But most were short-lived due, in my opinion, to the simple herbal remedies we employ when we're not feeling up to par. A jar of honey, a sliced lemon or two, and a mason jar with a lid are all you need to make a lemon & honey infusion to help with symptoms from a cold or flu. I add this to a cup of peppermint tea or even just stir a spoonful into hot water. 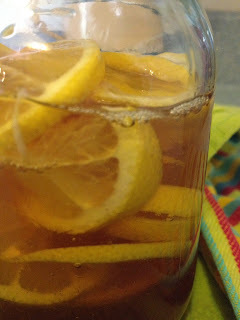 Ginger is also great infused in honey. And if you don't mind the taste, this is an excellent way to get the health benefits of garlic down! I keep jars of honey with lemon, honey with ginger, and honey with garlic on hand all year round. Tea time around here is so much more than just a pleasant way to spend a few afternoon moments. Tea is usually the go-to when something just isn't quite right. If one of the siblings isn't feeling well, the other girls will often make tea for all. With herbs, tea time is never boring and also can be a great source of herbal help when we're not feeling well. 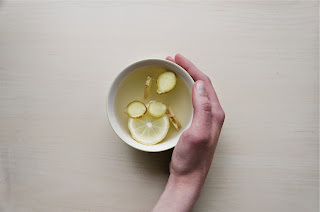 For winter ailments peppermint, ginger, sage, thyme, marshmallow root, slippery elm, nettle, and echinacea often find themselves in the tea pot depending on the symptoms at hand. And even in the midst of winter, my yard is beginning to be filled with dandelions, chickweed, and plantain, bringing not only the promise of spring but the joy of wildcrafting into focus. Soon it will be time to plant new herbs in the garden, but for now, I'm enjoying my herbal teas and the occasional foray out into the yard to see what's springing up. Any signs of spring in your part of the world yet? What's your favorite winter herb tea blend? *for information and educational purposes only, not meant as medical advice. Sending wishes for brightest blessings and many herbal adventures in the coming year! Need some last minute handmade gift ideas? Here are 3 herbal gifts that can be put together quickly, most likely from items you already have on hand. Dream pillows are simple gifts to make for Christmas gifting. I use Dream Herbs Pillow Mix from Mountain Rose Herbs but you could easily mix up your own blend using your favorite relaxing herbs such as lavender, rose petals, hops, chamomile, mugwort, and a few drops of rose or lavender essential oil.I tuck the dream herbs mix into drawstring muslin bags or sew up simple pillow shapes that can be slipped into a pillowcase. Add a tag wishing your loved one Sweet Dreams and you have a simple gift that will be a sweet reminder of you each time they put their head on the pillow. 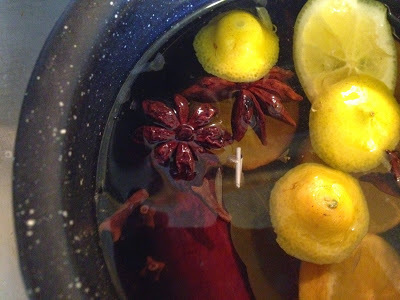 Herb-infused oils also make excellent gifts. 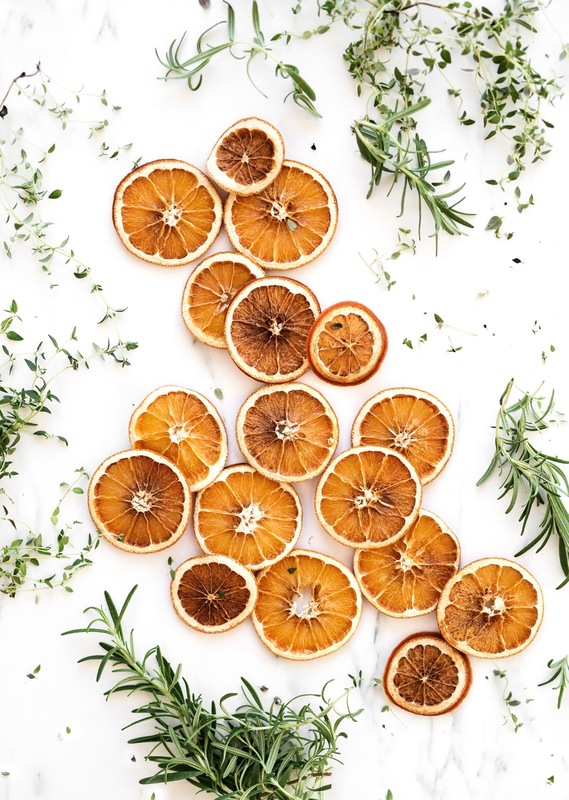 Sweet Almond or Olive oil infused with calendula, lavender, or other herbs of your choice can be placed in decorative bottles and given as body/massage oils. A few drops of a coordinating essential oil will give you a sweet smelling perfume oil to share. Bath salts can be as simple to mix up as adding essential oils to sea salt, though you can get creative and mix in other ingredients like Epsom salts, baking soda, even a small amount of liquid soap to make foaming bath salts. Peppermint oil makes a nice Christmas scent, or how about frankincense and myrrh, or my personal favorite lavender and rose geranium? Put the salts in a pretty container, label, and add a pretty shell or vintage spoon to scoop out the salts and you have a great gift for someone special. These 3 simple herbal gifts can be customized with different herbs and essential oils to please most anyone on your gift-giving list. And don't forget herb teas and herb plants or seeds for the herb lover on your list. These are almost always at the top of my own wish list! What is your favorite simple herbal gift to give or receive? Use your favorite combo or whatever's on hand. Cover with water and simmer on very low heat. Enjoy! 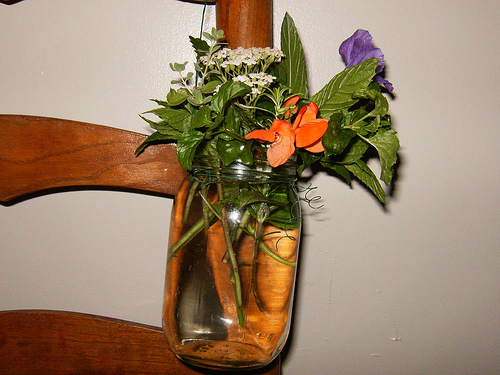 Herb jars are fun, frugal if you have a few herbs growing nearby, and are always received with joy. find a suitable jar,such as a pint size canning jar, and a bit of wire. Twist the wire into a handle and secure it around the neck of the jar. Fill the jar with water, then go out to the garden and snip a few of your favorite herbs and flowers and add them to the jar. You can embellish this herbal gift further by tying on a bow or pretty gift tag. If you choose herbs that root easily in water such as mint, basil or rosemary, add a little tag giving instructions for potting up the herb plants once they have rooted. This can be a gift that keeps on giving! What are your May Day traditions? *This post contains affiliate links, which means if you purchase from one of the links in the post, I may receive a commission. No extra cost to you, but I may be able to buy more herbs! I only share things I personally use or highly recommend, promise! The Herbal Academy has done it again! If you haven’t heard, they just released their Botany & Wildcrafting Course with an amazing pre-registration sale ($50 off)! The class is going to cover the art of wildcrafting and the science of plant identification so that by the end of the course, you will be able to identify new plants anywhere in the world using your newfound skills and a dichotomous key. I am excited to be signing up for this class myself, and I welcome you to join me! Here is a link to more information: Botany & Wildcrafting Course. I am so excited about this upcoming course from The Herbal Academy! They are hosting a giveaway of one free course enrollment right now. I'll be studying along with you, so if you're interested in botany and wildcrafting (and what herb lover isn't? ), go enter to win and sign up for updates so you will be ready when pre-registration begins in a few days. The dandelions are popping up all over in my area. Spring is the perfect season for wildcrafting. The Herbal Academy has a new Botany and Wildcrafting Course beginning next month! If you are interested in this great offering, be sure to sign up to be notified when registration opens. 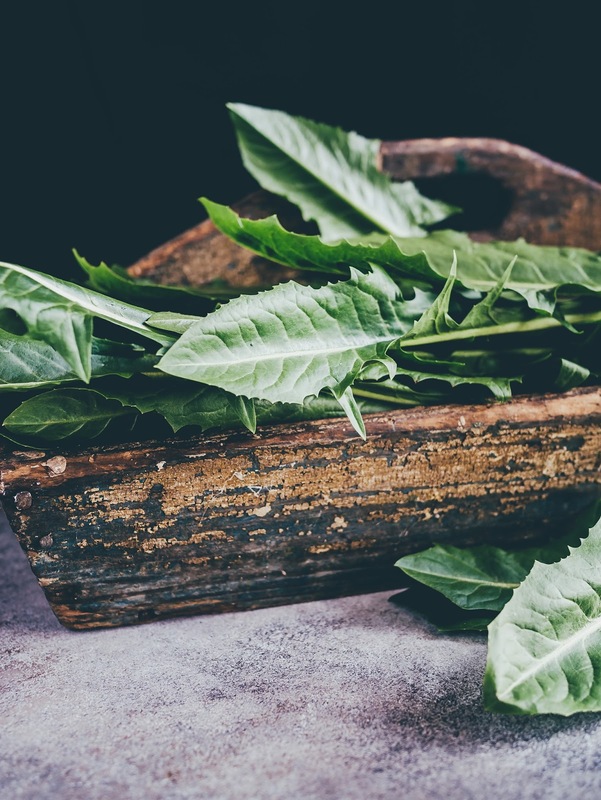 For starters, you can take a walk around your own yard and possibly find common herbs such as dandelion, chickweed, plantain, cleavers, and yarrow growing right under your nose (at least that's what happened to me when I first discovered wildcrafting)! One caution, be certain you 'know that you know' what plant you are harvesting. A good field guide is helpful for identifying wild herbs. A knowledgeable friend or family member is also a great source if you need help with plant ID. Online sites such as this one can be beneficial, too. I hope you will consider the Botany and Wildcrafting Course, it looks like it will be a fabulous way to learn both botany and wildcrafting. Do you have favorite herbs you already gather from the wild? 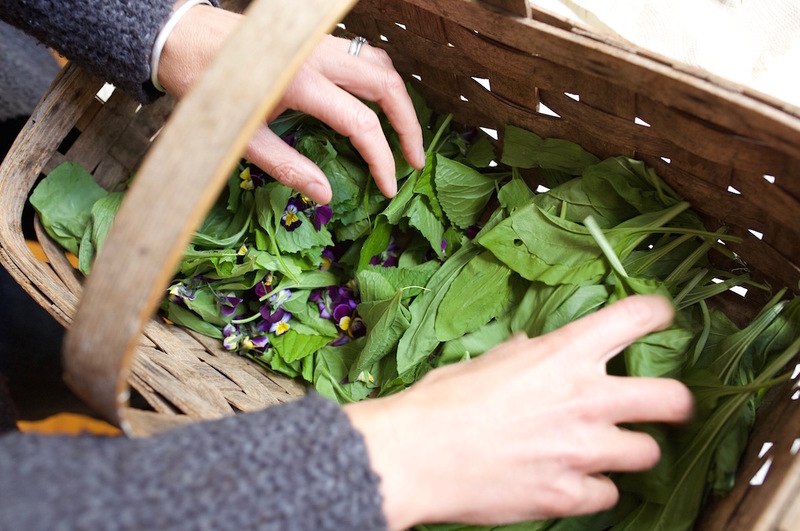 How about sharing your tips with us here- especially recipes for incorporating those wildcrafted herbs into spring dishes! Dandelion Pesto is one delicious way I like to incorporate dandelions into my spring menu. This brings me joy- a cart loaded with herbs, perennials, and other assorted green and growing treasures! Simple, herbal things bring me much delight. And when you are a family of plant lovers, everyone has to get at least something at the plant nursery. So there are herbs, tomatoes, and poppies for me, a natal plum for my husband, succulents for the middle love child, a 'glittery' ice plant for the littlest love (who at almost 16 is hardly little anymore), and a gift plant for a friend. All of these came from one of my favorite plant nurseries- Barton Springs Nursery. If you are ever in the Austin, TX area, you won't want to miss it! They have a great variety of herbs and plants of all kinds, pottery, seeds, gift items ... all the things an herb lover enjoys. What is your favorite herb and plant nursery? Please share because I visit as many as I can wherever I go! What are you buying for the garden these days? Spring will be here soon! It's time for seed sowing around here. 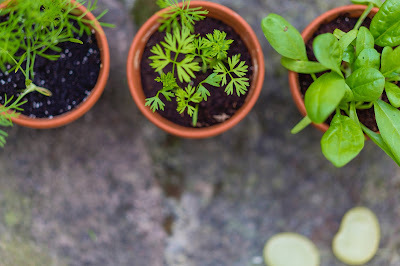 I love, love, love springtime and one of my very favorite things in the whole world is planting herb seeds in tiny pots during late winter in anticipation of spring. Seeds are a great way to begin or add to your herb collection. They are inexpensive, easily obtainable, and many herbs are simple to grow from seed. There are lots of places to purchase seeds. I suggest your local herb shop, nursery, or natural grocery store for starters- it's convenient, and you will be supporting local small businesses. Do you have a favorite place to buy seeds? Please share it in the comments! Today I planted seeds for poppies (love, love, love poppies), bachelor's button, sage, and nasturtium, along with some flowers- aster, hollyhock, morning glory. Dill and Cilantro were sown last week and more will be planted as it gets closer to our last projected frost date, which is March 31st. I am already seeing a few signs of spring- mints are unfurling new green leaves, hyacinths are in bloom, and the oregano has new growth just beginning to show. Oh, and the dandelions are popping up new green leaves all over. Just about time for a spring tonic! What signs of spring are showing in your part of the world? Are you planting seeds indoors or out, and what new thing are you growing this year? My want-to-plant list is always much longer than my growing space can hold- this is the year of the flower for me. I'm planting lots of flowering herbs, edible flowers and the like this year.